Male Cats - Heartland Pet Welfare, Inc.
Salem was a feisty tom cat before he came to the shelter with multiple injuries. He is all healed up now, but will always have a little scar by his left eye. 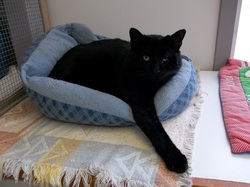 Salem is a big, muscular guy who is friendly with people, but not all cats. He may be tough looking, but he has a soft heart. Buddy is a black and gray tiger cat with some white markings. 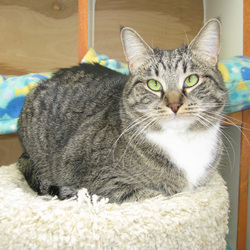 Buddy craves attention and is very sweet but can be shy with new people at first. His eyes are crossed a little bit, they are a pretty bright green color. He is adorable and would love to meet you. Pepper is a handsome black and white long hair cat. He can be shy with strangers and he is known for being quiet and calm. 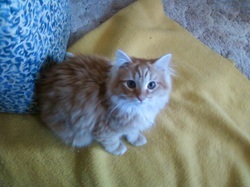 Cheerio is one fluffy kitty! He loves to play with toys; especially a ball with a bell in it. Cheerio may be shy for the first week in a new place, so you will have to be patient at first. He likes to be talked to and will come for toys. Cheerio also LOVES to be brushed, and will roll around to be brushed in different places (or for a belly rub!). Sweeney is also his buddy. Sweeney has short gray and white fur that is extremely soft. He is calm and affectionate, a very sweet cat. He is good friends with his buddy Cheerio. Sweeney enjoys to have his cheeks, chin, and belly scratched! He also likes to sit in your lap.